I am currently a second year MBA - Class of 2018, student at The Wharton School, University of Pennsylvania. I am interested in Technology, Entrepreneurship, and payments (Fin-Tech). I interned as Product Manager, at Square Inc., SF and at Quantcast Inc., SF during Summers 2017. 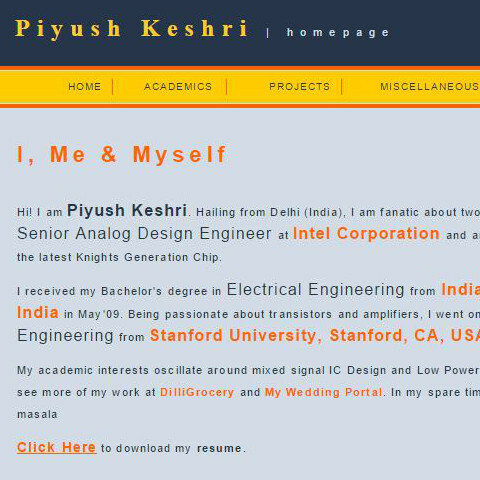 I worked as Senior Analog Design Engineer, at Intel Corporation, Santa Clara from 2011-2016. I completed MS(EE) from Stanford University, CA, USA in 2011 and B.Tech(EE) from Indian Institute of Technology Kanpur, India in May'09. My love for technology products have convinced me to pursue interests from Hardware and Software development to Product Management. 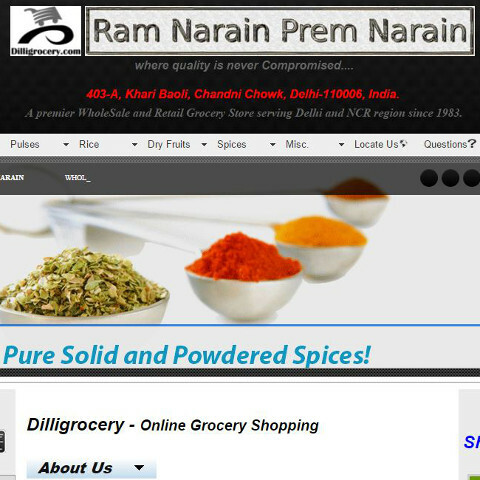 My innate desire to be a passionate businessman transformed brick-n-mortar family store into multi-employee Omni-channel grocery enterprise, Dilligrocery serving thousands of customers and corporate clients in Delhi, NCR region. I am an enthusiastic Product Manager and Entrepreneur interested in being part of a successful and productive team. 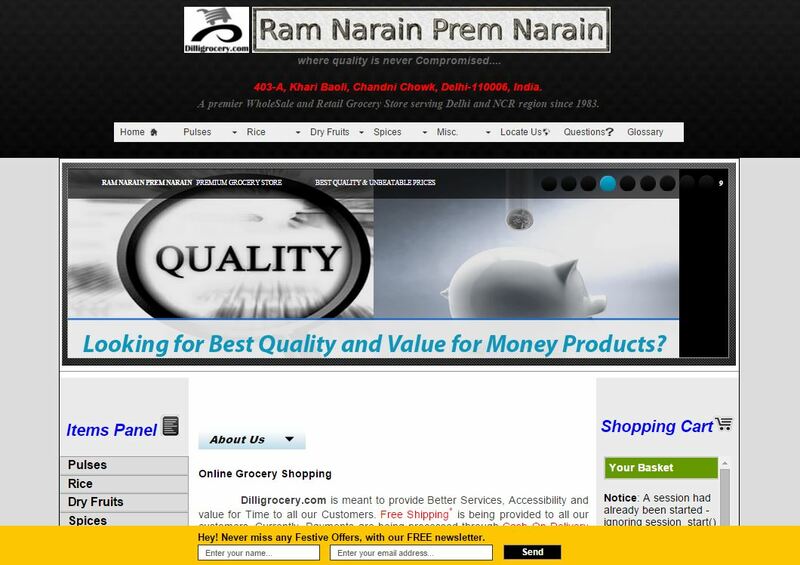 Currently, I am working on an idea, EasyPay for simplifying offline retail in India. Secured 2nd prize in Quantcast Intern Hackathon Challenge. Designed Resistor Compensation block involving Comparator design, Tx, vref Ladder. Worked on clock distribution in Rx/Tx clusters, Sideband Rx & Local Clock Macros. Leveraging scripting languages (Perl,Tcl) in evaluating circuits for corner cases and variations. 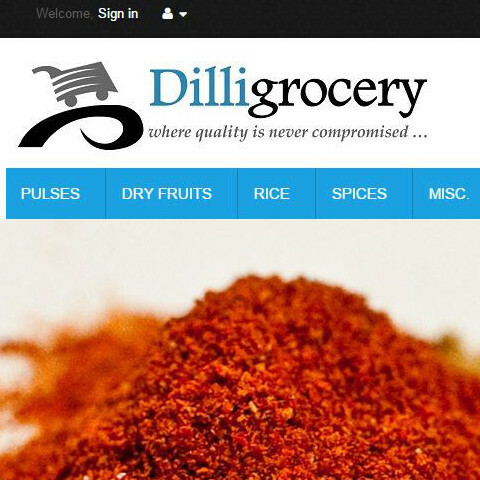 Online Grocery Store serving corporate clients and families across Delhi region, India. Providing relevant web-content to users based on users’ social-interest graphs. Fun I was having outside classes while I was at school! Analog Front End Design for Bidirectional Communication On 10m coaxial cable @ 3Gbps. Design Blocks - CML Driver, Z-network Replica, Echo Canceller, and Active Equalizer. Application - Automotive Infotainment Systems – Audio, Video HD Displays. Analyzed & designed highly Power Efficient CMOS Thyristor based Ring Oscillators. Application: DC-DC converters in Laptop Power Supplies. Market analysis of the WiMAX System and Designing of Transceiver Circuit on PCB for the 5-5.9 GHz and 2-3 GHz frequency ranges. Our team of three students designed a Digital Security Code Lock System using Atmega8 microcontroller, programmed in C as well as Assembly Language which operates on digital lock using the 16bit LCD display. Few moments of imparting knowledge on other side of podium! "Modeling Customer Data to grow business - Madison Reed". Summary of 6-weeks of intense work by a team of 6 multi-disciplinary students exploring and modelling customer data for Madison Reed and defining actions for the firm to grow business. Madison Reed is a premium, direct-to-consumer hair color product. The proprietory nature of the analysis limits sharing to a generic summary. "Maximising incident power absorption in multijunction Solar Cells". The project and the presentation is based on determining the optimum band gap of the materials for single/double and triple junction solar cells to maximise the photon absorption by the multi junction solar cells to optimize the efficiency. "Towards Highly Efficient Monolithic DC-to-DC to Converter". The presentation gave an overview on the state-of the-art of monolithic DC/DC converters, with low power, high efficiency, high switching frequency in (MHz) for a completely monolithic integrated switch-mode power converter. Hard earned Sweat that resulted in a Degree at last (almost :D ). Cleared Qualifiers for PhD Program in Electrical Engineering in Jan. 2011 with Rank 26 at Stanford University and took leave from PhD program. Analyzed the impact of Demonetization announced by Indian Government on Nov. 8th, 2016 on the Fintech sector and the required steps to push cashless drive within country. As a founding team of a Hi-Tech firm needed to negotiate the term-sheets from two VC firms and decide the favorable investment for the firm. Explored the trends in VR industry and how hypothetical Joint Venture between Windows and Intel can revolutionize the VR industry, similar to PC world. Who will win Autonomous Vehicles war? Explored the entry of incumbent (Ford), innovator (Tesla), and disruptor (Waymo) in Autonomous Vehicles industry and who will win through the lens of Technology Strategy. Helping Cavalry Regiment in Eastern Europe to optimize ammunition distribution for training purposes, using Linear Optimization. Each ADC operates at 400MS/s and can sample up to 1.6GHz signal. Clocked Bootstrap Switch & Double Tail Latch Type Sense Amplifier based Comparator. •	Analyzed trade-offs for various topologies specifically– Capacitive feedback, Resistive feedback and Integrator-Differentiator approach For MEMS Resonators for GSM Systems. For high speed Optical Communication Systems using 180nm CMOS Technology. Implemented Cherry Hooper Architecture for High Gain & Bandwidth. For WiFi Chipsets at operating frequency of 2.45GHz & Bandwidth of 200MHz. Power Gain 30dB and IIP3 ~ - 20dBm using 90nm CMOS Technology. Architecture - Inductively Degenerated Cascoded LNA & Double Balanced Active Mixer. Synthesized, placed and routed complete ASIC design using 90nm CMOS Technology. Employed low power Verilog coding techniques with hardware reusage and parallelism. Optimized throughput & power by 3.5X, using - Triangle Merging, backface Culling. Special Acknowledgement for “Lowest Energy &Minimum Area Optimized Design". Designed a 64kB complete SRAM memory using 45nm CMOS Technology. Significant Techniques – Divided Wordline, partitioned Bitline, variable delay SAE signal. To connect line modules in a High Speed Router operating at 40Gbps. Employed a pair of Central Crossbar switches with backplane architecture. Various feature extraction and classification algorithms explored. Best results obtained using One-against-All SVM & extracting features using HOG process. The goal of the project is to get a render speed of 500 Million Î¼Polys/sec while consuming as little power and area as possible. The baseline rasterizer provided runs with a clock period of 1.05 ns and has a throughput of 0.083 Î¼Polys/cycle( or 79 Million Î¼Polys/sec). We were able to obtain a throughput of 550 Million Î¼Polys/sec. Hence, our design meets the throughput requirements, has an optimized FOM value and also has power and area dissipation within the specified budget of 300mW and 1mm2 respectively. Our implementation strategy has received the "Lowest Energy Design with Minimum Area Overhead" award within the complete class and have given special presentation over the strategies being followed by us. (NOTE: Video Link for the presentation will be soon uploaded). The project is based on Designing the amplifier for pore based Bio-Sensor chip with the required specifications (as mentioned in design problem statement). The robust design for the amplifier circuit has been implemented and simulated in the HSPICE. Our design has received the "Best Robust Design with Least Power Consumption" award within the complete class. Designed Complete Hardware-Software platform for requesting emergency services. 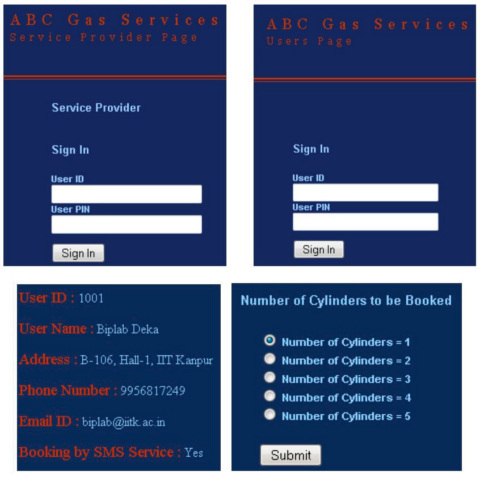 Integrated RFID & GSM Technology with the Central Web Based Database System. Developed complete IVR System & Web Platform to connect to central Database.The project is based on Designing Networked RFID System (NRS) ",which is the extension of the project "Remote Gas Service" which has filed the National patent on April'08. The project is aimed at Designing a networked RFID system which integrates RFID reader & Web interface with the Web based Centralized Database Management System. The system has been extended and has been integrated with the wireless access using GSM modules & also using wired telephone lines to form Interactive voice response system to access Database. The project has been aimed with the objective of implementation in remote and rural areas to provide emergency services through efficient reliable system. The project is soon to be implemented within the campus for initial phase testing. The project is based on designing the compensation circuit for the CMOS thyristor based Current Starved Ring Oscillator design operating at 100kHz to reduce the Temperature Sensitivity of the circuit. Project is based on the analysis of the performance of different high speed low power flip flops such as Hybrid Latch Flip Flop, Sense Amplifier based Flip Flop, Semi- Dynamic Flip Flop, Master Slave Flip Flop, Clock Gated Master Slave Flip Flop and other modified designs of Sense Amplifier based Flip Flops. The project is based on designing the compensation circuit for the CMOS thyristor based Current Starved Ring Oscillator design operating at 100kHz to reduce the Temperature Sensitivity of the circuit. The technology used is 0.18micron. The project and the presentation is based on determining the optimum band gap of the materials for single/double and triple junction solar cells to maximise the photon absorption by the multi junction solar cells to optimize the efficiency. 6th Indo-German Winter Academy, Guwahati, India (13th-19th Dec.'07) Mentor:Prof. Heiner Ryssel, University of Erlangen. Contributed presentation in 6th Indo-German Winter Academy-2007, held from 13th-19th December’07 at IIT Guwahati. The presentation gave an overview on the state-of the-art of monolithic DC/DC converters, with low power, high efficiency, high switching frequency in (MHz) for a completely monolithic integrated switch-mode power converter. The presentation is based on exploring the dynamics of mobius transformations and image compression technique using fractals. Fractal Image Compression technique can be used for Image Compression effectively reduces size of the image file from few MHz to few kHz. Compiled a report dealing with the technicalities & difficulties in the use of GHz frequency for RFID Systems. Report compiled to investigate the history behind the Israel - Palestine conflict and how it relates to humanitarian crisis and human rights violation especially in Gaza strip. Suicides by Farmers in India-Economical or Psychological Reasons? Report compiled by our team of three students aimed at investigating the psychological reasons for the suicides by farmers in India besides economical reasons. Our team under my leadership built a model of mechanism to implement multi storey car parking system.Project successfully completed in Mechanical Engineering Lab. Our team under my leadership built a model of Kattwyk Bridge, Hamsberg, Germany in Material and Matellurgical Lab using arc welding. In past time I have tried learning few of these things of my own. Started web coding from basics in PHP & MySQL. Bread & Butter in simplifying daily tasks at work. Languages that satiate my thirst for Electrical Engineering. Tools I love most for complex engineering problems. Bread earner tools in daily job. Projects involved with in past. Finalist - Citadel Data Open Championship 2017. Represented University of Pennsylvania Team for the final round of challenge in NYSE. Winner - Stripe Product Challenge, INSEAD Singapore. 1st Prize - Citi Ventures FinTech Challenge , Wharton. Winner - Avis Data Visualization Challenge, Wharton. Top finalist for Class of 2018 Big Idea Innovation tournament, Wharton. Product Division's Highest Honor “Division Recognition Award'15” for exceptional contribution in debugging Knights Family product, bringing to life memory interface on First Silicon (A0), despite numerous challenges with this first generation memory. Intel's Highest Honor “Intel Achievement Award'15” to entire team for exceptional performance and pushing the envelope for I/O industry. Benefactor of IIT Kanpur with setting up “Nirmala & Ashok Keshri Scholarship” in 2014. 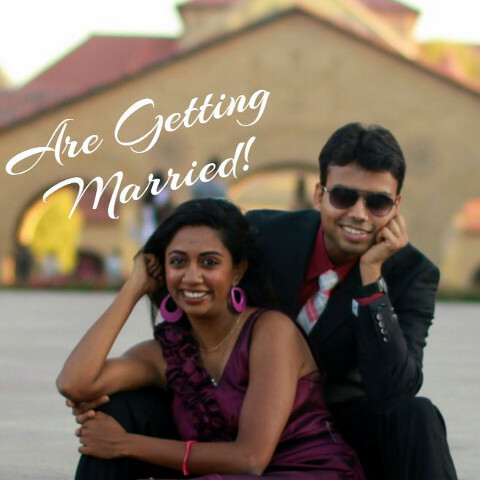 Recipient of prestigious John Linvill Fellowship, Stanford University for the academic year 2009-2010 . Best project for Lowest Energy Design with Minimum Area Overhead in VLSI Systems Course at Stanford University in the academic session Fall'09. Best project for Best Robust Amplifier Design with Least Power Consumption in Analog Circuit Design Course at Stanford University in the academic session Fall'09. 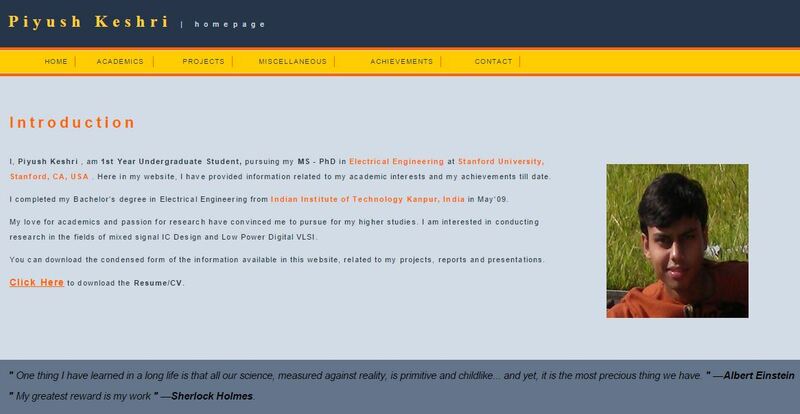 Nominated for Best B.Tech Project in Electrical Engineering Department at IIT Kanpur. Recipient of Academic Excellence Award for the 2 consecutive Academic Years 2005-2006 & 2005-2006, at IIT Kanpur for excellent academics. Scored SPI (Semester Point Index) =10.0/10.0 in 4 consecutive Semesters (3rd, 4th, 5th & 6th). 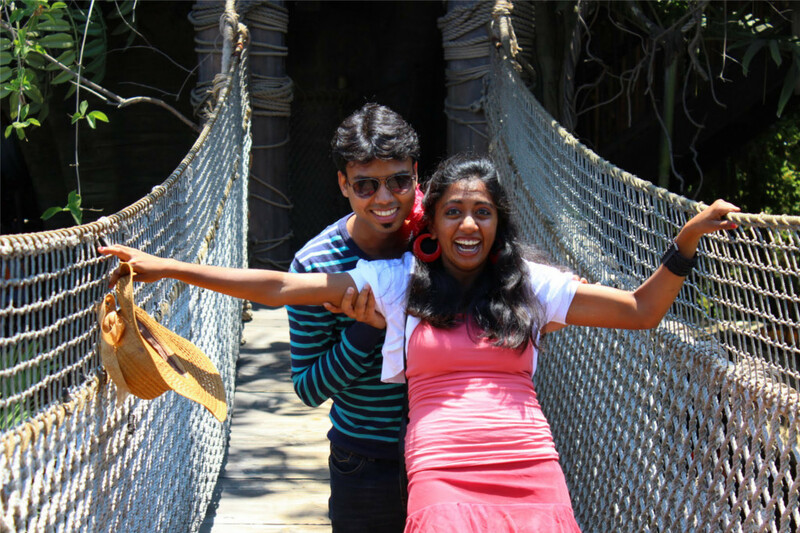 Recipient of Sri Temasek Scholarship, IIT Kanpur for the year 2006-07 for outstanding performance in academics. Recipient of Dr. D. R. Bhagat Scholarship, IIT Kanpur for the year 2007-08 for excellent academic record throughout the year. span>Represented IIT Kanpur in 6th Indo-German Winter Academy'07, held at IIT Guwahati. Represented IIT Kanpur in 1st Indo-US Research Academy'08, held at Pune. Scored All India Rank: 270 in IIT-JEE, 2005 (Out of approx. 0.175 million students all over the country). Scored State Rank: 1 in DCE-CEE, 2005 (Delhi College of Engineering Combined Entrance Exam, 2005,(Out of approx. 0.055 million students)). You can contact me through phone/email. I won't bite you. © Designed by me. All Rights Reserved.